Meadowside, Dundee, shortly before the land was acquired by The Albert Institute Company. It might not at first sight be obvious why we should be so interested in who the original subscribers to the Albert Institute were. Part of the reason is to be found in the speeches of the men who spoke at the public meeting held late in November 1863 to launch the project. The meeting was held in the Royal Exchange and was attended by many of Dundee’s leading businessmen. Sir David Baxter of Baxter Bros was in the chair. Also present were W R Baxter, MP, along with many of the city’s ministers, as well as Lord Provost Parker. What several speakers stressed was the absence in Dundee of fine civic buildings, and especially of public art. The best there was, it was claimed, was the Royal Arch. Compared to other towns and cities there was an absence of statues, the exception being the recently erected statue of Sir David Baxter in Baxter Park. Mentioned too was the inadequacy of public library and reading provision for the working classes. The answer to this awareness of what might be called Dundee’s cultural deficit was the Albert Institute. In this respect it was to be transformational. It was the first of several steps taken in Dundee in the 1860s and 1870s and 1880s that made modern Dundee. But what was also significant was that from the outset the Albert Institute project was not to be monopolised by the city’s wealthiest citizens. Sir David Baxter, who led the subscribers, was anxious that it should ‘have the support of the whole community.’ By this he didn’t mean the low paid textile workers but rather what we now call the middle classes. This is why the subscription comprised 2,000 shares of £10 each. 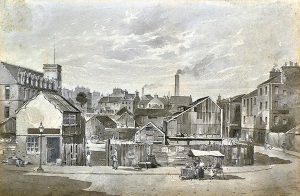 Although there was a rapid take up of shares, Sir David Baxter was loudly applauded when he proposed that ‘a few thousand pounds should be left…to those gentlemen who may not think it prudent to go beyond from one to five shares.’ As shareholders these individuals were making a statement: they had a serious commitment to the city, its culture and image. We want to know who these men were (although there were some female subscribers), and just why they might have been prepared to invest. Whatever their motivations, collectively their impact on the appearance, culture and image of Dundee was immense.